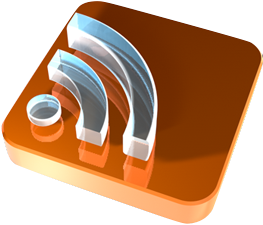 RSS feed for the series. Girl Genius tells the story of Agatha Heterodyne, lowly lab assistant lost in a world of Mad Scientists known as Sparks, demented Minions knows as, er, Minions, and a talking cat known as Krosp. (MROOOWWW!!) Uh, excuse me, that’s Krosp the First, Emperor of All Cats. Agatha’s world is safe and fulfilling, free of (generally speaking) Minions and (all but a few) Mad Scientists. Until the Spark within her suddenly changes everything. 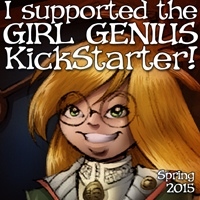 The story of Girl Genius may be found online at the Girl Genius Webcomic and other Studio Foglio sites. The comic is free to read online, but if you enjoy it consider making a purchase from the store! The comic embodies many things I cherish in good storytelling. 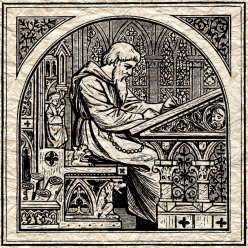 It is clever, witty, free of abusive language, free of inappropriate images, involving, imaginative, consistent…. It is, quite simply, my favorite web comic of all time and some of my favorite storytelling of all time. The characters are wonderfully developed and uniformly sympathetic (even when they’re despicable). The story is complex and easy to understand. The worldbuilding is subtle and mythic, hinting at history and adventure just beyond the borders of the comic panels. The narrative styling has been dubbed “gaslamp fantasy” by creators Phil and Kaja Foglio, a phrase that does justice to the breadth and scope of this modern mythology. Girl Genius Radio Theatre is something else entirely. These stories were performed by Phil, Kaja, and their friends at conventions in front of a live audience. Yes, they are entertaining stories set in the world of Girl Genius, but they are also something more. They are the touchstone of what makes this story modern mythology. Rather than being “in canon” adventures of Agatha and crew, they are more like legends of the adventures of Girl Genius. These aren’t Agatha’s stories, but rather “stories that people tell about Agatha”, as the Professors Foglio themselves explain. These recordings have floated around fandom since the recording sessions at the conventions. I’m pleased to host them as a mirror site in compliance with the fan site guidelines. Ahem, “This site is not approved by, sponsored by or affiliated with Studio Foglio LLC or Airship Entertainment.” The intention for the Radio Theatre recordings was always to allow fans to freely distribute them; they bear a Creative Commons license for just this purpose. Enjoy them. Share the love. Buy their stuff so they can make more Girl Genius.